shown standing in a vigorous pose with head lowered and turned, mouth open and nostrils flared, the powerful arched neck with long mane combed over the near side and covered with a cream-colored glaze, the parted forelock swept back to each side across the forehead, with one ear pricked and the other ear folded back, the body covered in a strong chestnut-brown glaze, showing streaks of cream-colored glaze on the head and chest, caparisoned with an elaborate bridle ornamented with florettes on the noseband and crisply moulded palmette pendants on the nose, forehead and cheeks, the saddle covered with an amber-glazed cloth gathered into pleated folds draped on either side over a cream-dappled green-glazed saddle blanket, the multi-colored strap across the chest decorated with five white tassels, the trappings on the flanks with six palmette pendants on either side hung from alternating long and short straps and splashed with bright green glaze, linked over the hind quarters by six straps radiating from a central roundel moulded with scroll motifs, above a short docked and bound tail covered with straw glaze, the hooves also picked out in pale straw-toned glaze, on a flat rectangular unglazed base, the pinkish-buff-colored pottery splashed with brown glaze running down from the legs. 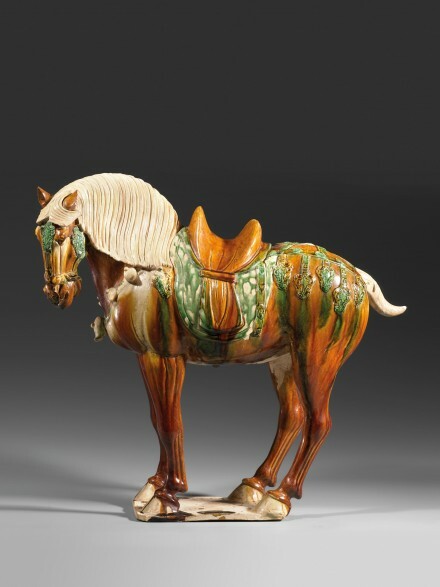 American Private Collection, Washington D.C.
A very similarly modelled and decorated sancai-glazed horse of the same size is illustrated in Mayuyama, Seventy Years, Volume One, Tokyo, 1976, p. 77, no. 207. Compare also the similarly modelled larger sancai-glazed figure of a saddled horse dressed in very similar trappings illustrated by Wu, Earth Transformed: Chinese Ceramics in the Museum of Fine Arts Boston, Boston, 2001, pp. 40-41, from the John Gardner Coolidge Collection.